This print was clearly published as a deluxe edition judging by the liberal use of metallic inks. The publisher is unknown. 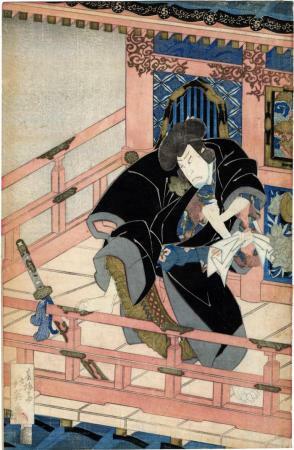 The full composition is illustrated in Ikeda Bunko, Kamigata yakusha-e shūsei (Collected Kamigata Actor Prints), vol. 2, Osaka, 1998, no 330. It represents a performance of Kinmon Gosan no Kiri at the Naka Theater in Osaka on 3/1834.